Plane ticket to Denmark not required. 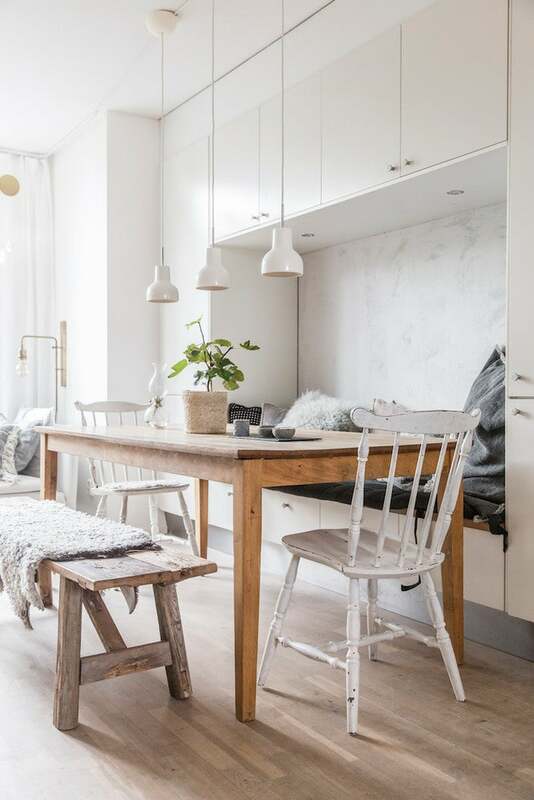 Between perusing every new Ikea collection with the dedication of a private investigator and pinning every calm, texture-filled home to our “dream home” Pinterest board, suffice it to say that we’re thoroughly obsessed with all things Scandinavian style. The minimal but warm, simple but sophisticated style has captured our attention (and our wallets), and there’s no turning back. And we’re not alone, either: According to a recent survey of Google search data, the favored style in 11 states is Scandinavian. The design envy is real. But how do you actually master this trendy style? It’s a lot more than just painting your home white, adding a sheepskin throw, and calling it hygge. Capturing the aesthetic so beloved by Nordic countries is an art—which is why we turned to the experts to figure out how to mimic the look in our own homes… even if that home is a tiny third floor walk-up with nary a window in sight. Here’s what they had to say. For Niki Brantmark, the blogger behind My Scandinavian Home, author of best-selling books like Lagom: The Swedish Art of Living a Balanced, Happy Life and The Scandinavian Home, and “Best International Blog” winner at our 2017 design blog awards there are five cardinal rules to follow: Declutter, keep it clean and calm, mix and match the old with the new, choose natural materials, and use negative space. “Scandinavian design is centered around a calm, clutter-free, pared-back look,” says Brantmark. “They rarely have anything in their homes that are superfluous.” And while cutting down to the essentials—maybe in a Marie Kondo-approved fashion—may conjure up images of an uninviting albeit simple home, Brantmark says this isn’t the case at all for Scandinavian homes. Instead, they rely on natural materials like linen, wood, stone, and wool to add texture and warmth, thereby creating a space that feels lived-in and homey but not in a disorganized way. If you want your style advice to be less theoretical and more of a shopping list, this is for you. Both Brantmark and Torp agree that the best way to achieve Scandinavian style is by actually purchasing Scandinavian products—design staples beloved in Nordic countries crafted to stand the test of time. A few standouts: The Louis Poulsen PH 5 pendant light, the iconic Kubus candleholder (originally designed by Mogens Lassen in 1962; Torp recommends choosing the black version to stay true to the piece’s origins), ceramics from Marimekko, a marble-top coffee table for your living room, plenty of plants, a classic modular sofa like the Mags couch by Hay, and a slow coffee machine (Brantmark recommends the Bodum Pour Over set) for afternoon fika. Wherever possible, opt for wooden floors—the mark of a true Scandinavian home, generally in the form of broad light oak planks—and pay homage to classic Scandinavian mid-century designers by splurging on one big-ticket vintage item from big names like Hans Wegner, Alvar Aalto, or Arne Jacobsen. According to Torp, pieces from those designers are timeless and iconic. Looking for something a bit more wallet-friendly? Brantmark has a favorite Ikea collection: the Stockholm PS range. She recommends the coffee table, which currently retails in the US for only $69. 1. Huset – “Huset” quite literally means “the house” in Swedish, Danish, and Norwegian, and there’s more than enough to choose from here to decorate yours. 2. Finnish Design Shop – This online store curates pieces from over 150 design brands that fall under the “Nordic design” category. 3. Design Within Reach – The company may not be based in Scandinavia, but the timeless yet contemporary items it sells are definitely in line with the style ethos of the region. 4. Etsy – Where else are you going to find cool, vintage, one-of-a-kind Scandi designs (minus the plane ticket to actual Scandinavia)? 5. Bemz – This Scandinavian design company specializes in creating Scandinavian-approved custom covers to give your Scandinavian ikea furniture a new look. Meta. Also, in case it wasn’t made clear earlier, kiss your wall-to-wall carpeting goodbye. The Nordic approach values wood floors and rugs; but if you’re concerned about your home feeling bare and cold, Brantmark advises layering rugs to create more coverage.